As I mentioned last week, my husband and I spent our 4th of July holiday in the Upper Peninsula of Michigan visiting family. We ended up taking a day trip to Marquette which is about an hour away from where we were staying and along the shores of Lake Superior. 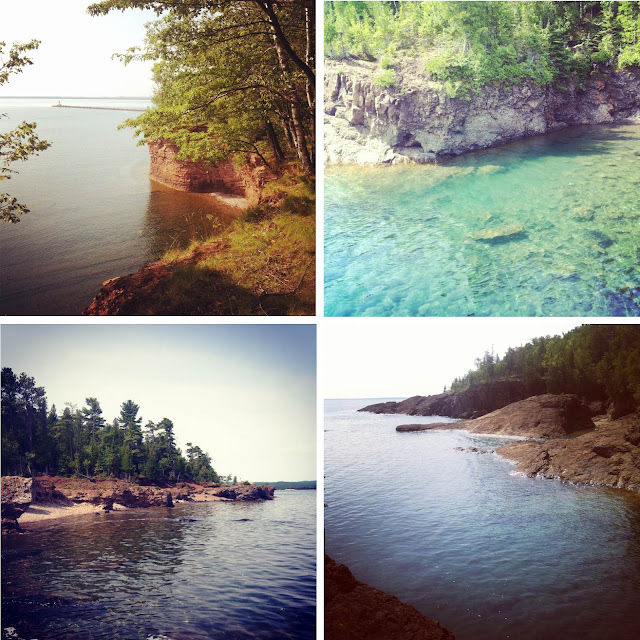 Marquette is quickly becoming one of my favorite places in the state - - and I don’t just mean in the upper peninsula! It’s the perfect mix between a small college town and a natural retreat. Annnnnyway, on our way home we made a quick stop in Manistique for some fresh from the garden fare! My husband’s aunt and uncle (shout out to Barb and Jude!) have an awesome (and huge) garden and totally hooked us up. So with all this new grub (and after months and months of wanting to try this recipe) I decided it was time! Time to try KALE CHIPS! I think it was around this time last year when kale recipes started popping up everywhere. Some people love it, some hate, but it always sounded like something I needed to try because I LOVE potato chips! And if they could somehow even come close to a substitute, I would be one happy girl. Plus kale is like the super foods of all super foods and it always feels nice to do something good for your body. This is a recipe you're going to have to perfect to your taste overtime (more salt, less salt, etc) but for my first go – DELICIOUS! If you crave salty snacks like I do, I would give it a chance and let me know what you think! Or if you’ve already tried them, leave a comment below with your thoughts - rabbit food or nature's potato chips? 1. Wash and dry your batch of kale - - make sure to really dry or else your chips will steam instead of bake! 2. Sprinkle (or mist) 1 Tbsp of EVOO (extra virgin olive oil) and 1 tsp of salt. Again, don’t overdo it on the oil. Too much = soggy chips. 3. Place the leaves in a single layer on a baking sheet. No need to grease the pan with the EVOO. 4. Bake @ 275 for 20 minutes - flipping the chips halfway. As you can see, they shrink a TON. I mean like shrinky dinks small. I think one big batch of kale would be a suitable snack for about 2 people. Serve them up with a nice cold beer and it's like they cancel each other out! For more help, here's a video demo from my favorite Hungry Girl!